Picture from simon3 : Grassy greeny mossy view from top of Ballyteige. Picture: Grassy greeny mossy view from top of Ballyteige. As others have reported, not so hard to get to the top. What a remarkable place. 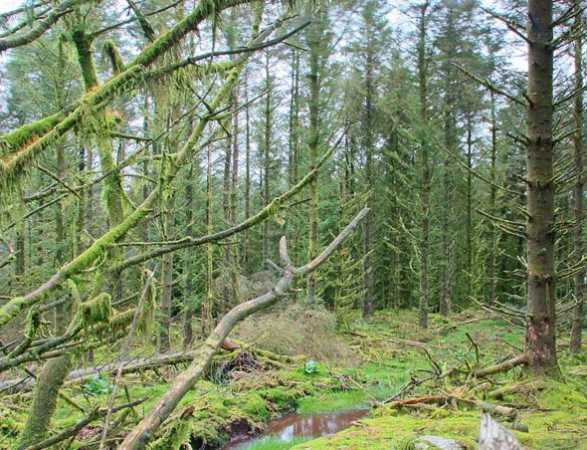 Other wooded summit areas have lots of moss however because the trees (Sitka Spruce) have been thinned so much here a lot of light reaches the carpet floor which then becomes bright green. Other members have mentioned the damage to the area which has been cut by tracked vehicles with huge gouges, half a metre deep and wide. However these gouges now mostly have a mixture of grass or sphagnum moss growing in them which makes them easier on the eye and underfoot.